Since I started writing this blog – actually, since I started sharing the photos of the work we’ve done on our home – I’ve actually been asked for advice on how to update a particular part of my friends’ homes! ME! Now I understand why people quit their day jobs in order to take up a career in design, because every time someone asks me for advice, I feel totally flattered. Like a design star! But also a bit fraudulent, because my experience is minimal. I am no Bob Villa. I’m like Bob Villa’s neighbor who notices all the nice work Bob has done over at his home and says “Huh, maybe I could do that too” and then gives it a try with little knowledge and no experience and mixed results. And if Neighbor Bob were to come over and inspect it he could probably find a million things wrong and another million ways to have done it better. Fake it till you make it, I say! Anyway, today I’m going to put all the nitty-gritty details in one place and tell you how I painted our kitchen cabinets! And I’m not going to lie and be all “Here it is in three easy steps!” Oh no. This is detailed, all-encompassing, the extended remix. For perspective, here’s what I had to start with. 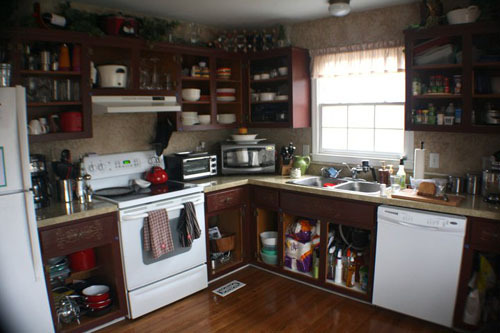 Our house was built about twenty years ago, and as far as I can tell, that’s exactly when these cabinets were installed. Underneath the paint is 1990s-era heavily grained orangey-oak, but at least they are in fact solid wood. The owners just before us, perhaps because they despise orangey-oak as much as me, decided to paint the cabinets brown with red glaze. 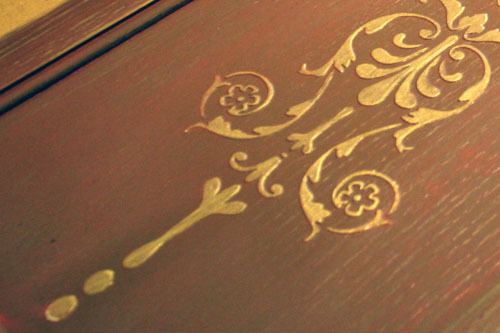 They also stenciled on the gold design, which is actually raised less than 1/16” off the cabinet. I asked the previous owner during a walk-through how she did that, and she told me she used an extra-thick stencil and “sheetrock”. I nodded blankly because... sheetrock is drywall, right? It was years later, just recently, that I finally figured out she probably meant joint compound, the “mud” that’s used to seal seams between drywall panels. So yeah. This is the sort of thing that looked great ten years ago, but sorely needed updating. If it weren’t for the stenciled design, I might have tried to strip the paint off the cabinets and stain them, maybe with Polyshades. But I figured the joint compound was probably in the grain of the wood, which would make the design visible even if I sanded it down. So I left that alone. I also didn’t know why they painted them – maybe just for a change, but what if there were stains, or water damage, or mismatched wood? 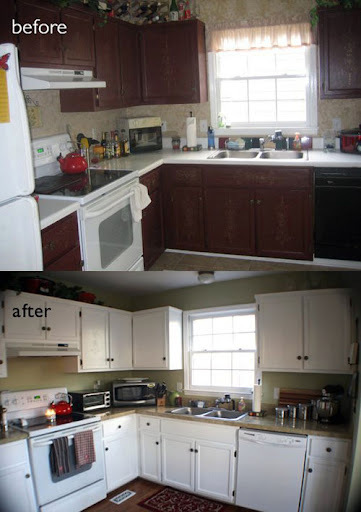 (They did install some pantry cabinetry themselves, which could have a different finish.) It would be awful to strip them and then discover I’d have to paint them, after all that work. And anyway, above all, as much as I dreamed about refinishing the lower cabinets with a walnut stain, and the upper cabinets in a chalky gray, and building up the cabinets to the ceiling, and installing awesome oil-rubbed bronze hardware, and painting the insides of the cabinets white, and cutting out a few door panels to install frosted glass, and even maybe some in-cabinet lighting: THIS IS NOT MY FOREVER HOME. The only time and money I should invest is the amount needed to get it sold. So I did what everyone and their grandmother is doing nowadays: I painted them white! And here is how I did it. “Really, Sarah? You think I don’t know better than to take down the cabinet doors before painting them?” Well, you never know. If it’s other furniture, like shelving or something with drawers, take them apart as much as you can to paint the individual pieces. I know. 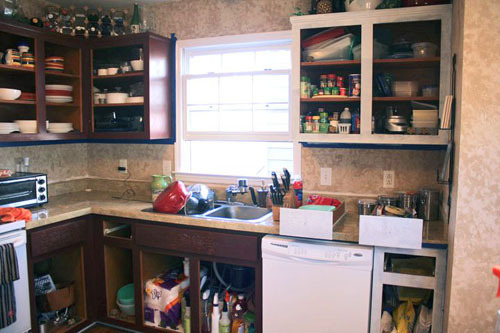 This part is totally no fun and you end up having to face the disaster inside your kitchen cabinets for weeks. But bear with me. Before you start taking down all the doors, though, mark them so you know where to put them back! I just wrote numbers on blue painter’s tape (two “stickers” per number), and stuck one on each door and one where it belongs. You may think that all your cabinet doors are the same, and I thought mine were too, but once I took them down I realized that they were ALL DIFFERENT, every single one, because of the dimensions or the holes for the hardware. Thank goodness for foresight. I also kept the hinges and screws for each cabinet door inside the cabinet, on the shelf adjacent to THAT PARTICULAR DOOR. 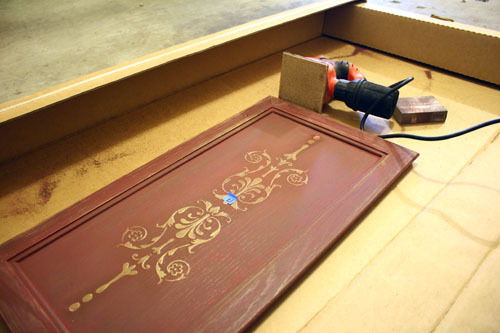 The screw-holes in each door may be ever-so-slightly different and the hinges are probably also ever-so-slightly different, so don’t assume that you can mix-and-match the hardware. Save yourself the headache – at least, from a bigger headache – and keep everything paired up as much as possible. Kitchen cabinets are gross, especially when yours are dirt-hiding dark reddish brown and you are a twenty-something who hates cleaning cabinet doors. Even if they’re not obviously dirty, they probably have a bit of layer of oily grime that needs to come off. Many cabinet-painting tutorials I read said to use TSP, but that meant an extra trip to the store and something extra to buy. So I used Windex with degreaser and a non-linty dustcloth. Close enough, I guess. In general, primer and paint adhere less well to glossy surfaces than roughed-up surfaces. So if you’re dealing with unfinished, pre-sanded wood, or wood painted in a flat paint, then you can certainly skip this step. However, oil-based primer is pretty good at bonding, so if you’re feeling particularly daring, you could maybe skip this step even if you are painting over a glossy finish. I was not feeling so daring. I wanted to make sure this would be extra-durable. Also, there were some parts of the cabinets where the previous paint seemed a bit gunky, and I knew I would just make it gunkier by painting over it. So I sanded. For the flat surfaces, I used my little hand-held sander with 100-grit (medium) sandpaper, and for the crevices, I used a medium-grit sanding block (a foam block wrapped in sandpaper). The objective wasn’t to get all the paint off, just to rough up the surface. 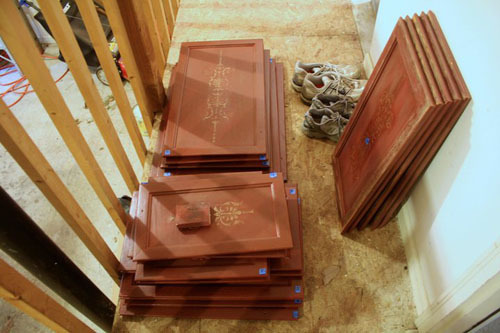 After you’re done sanding, you’ll need to wipe them all down AGAIN. Really, really, really well. You don’t want your finish to be gritty or dusty! Furniture, especially cabinets, can take quite a beating when they’re used – especially if you’re me. I fling my cabinets open with enough force to bounce off appliances, I bang edges of pots and pans on them, I open them with grubby hands such that they need wiping down. All of that means I wanted a durable, non-chipping finish. And the secret to durable, non-chipping finish is oil-based primer. Accept no substitute. Primer adheres to the surface below, and is slightly tacky even when dry, which helps the paint adhere to it as well. YOU MUST PRIME. MUST MUST MUST. When I discovered that the previous owners didn’t seem to prime the cabinets, all the chipping suddenly made sense. Even if you think something won’t be handled roughly, err on the side of caution. One chip and there goes your hard work. Have I convinced you yet? PRIME! To prime, I used Kilz original oil-based primer, applied with disposable brushes (2”) for cutting-in – they don't offer a lot of control for cutting-in well, so I taped off my walls and new countertops – and foam rollers (6” skinny) for the broad surfaces. Cleanup of oil-based primer (and paint) requires mineral spirits, so I wasn’t about to use my favorite brush and potentially ruin it. Also, this stuff is noxious. I primed (and painted) all the cabinet doors in our garage, but the kitchen cabinet boxes are – obviously – stuck in the kitchen. So, open all the windows and keep your children out, if you can. I don’t clearly remember crawling around behind appliances to prime our cabinets, so be prepared to lose a few brain cells. I ended up using two coats of primer on everything, because our cabinets were so dark to begin with. 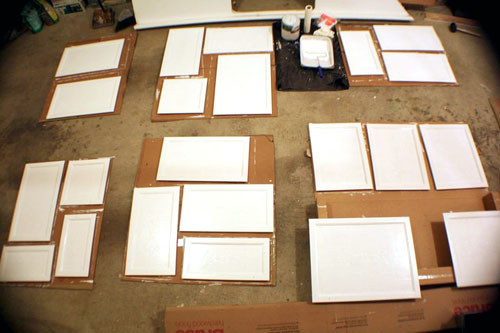 Primer dries pretty quickly and you can usually add a second coat in a half-hour. However, don’t expect the primer to look nice and finished. It won’t. But don’t worry about that! The last sanding step was optional, but this one isn't. Primer can have a rather rough texture, and if you go over that with semi-gloss paint, every little imperfection will show up. In this case, you want to sand with a finer grit sandpaper than before; I used a “Fine” sanding block which is around 220 grit. You want it to be smooth to your eye, and to the touch, but it’ll still be tacky enough to adhere to the paint going over it. FINALLY OMG SIX STEPS IN TO “How to paint your cabinets” WE ARE GETTING TO THE PAINTING PART! This part is easy. For this, I used a gallon of Behr Ultra (that’s paint and primer in one, for extra-durable finish) in latex semi-gloss off-the-shelf white, applied with my favorite brush for details and cutting-in and another 6” foam roller for the broad surfaces. Paint brand and color are flexible, but you really do want semi-gloss, or at least satin, for the ability to clean it well – flat and eggshell finishes can get water spots and stain more easily. 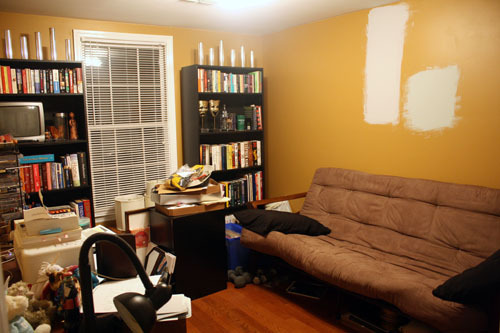 Personally, I like latex even though I understand that oil-based paint is even more durable, because I don’t like to deal with oil-based paint or primer any more than necessary, and anyway, I hear that white oil-based paint can yellow over time. The worst part about painting is waiting for it to dry. If you have the patience, give everything a full 24 hours between coats (I didn't, but I probably should have), as well as 24 hours before flipping the doors over to paint the other side, if you are painting the insides too. But yeah. That’s about it. Painting is the easiest part! Again, before you do let EVERYTHING dry. Everything, completely dry! I know, I wanted to rush to put it all back together too, but LET IT DRY. Hum the Beatles if you have to. Better yet, rewrite all the lyrics to correspond to painting cabinetry with the chorus “Let it Dry.” That’ll take up some time. Okay! Once everything is totally dry, then you might decide to stick some little pads on the inside of the cabinet doors and drawers so they don’t bang shut and ruin your paint job. I used some from IKEA that apparently aren’t listed on their website. Then it’s just a matter of matching up those blue numbered stickers and hanging them up with the exact same hinges and screws as before. Except... it will still take a LOT more time and grunting than you think it will. Even keeping everything matched up, some doors may need some adjusting. It took me a little while, but I finally figured out to attach the hinge onto the door almost all the way, then screw the hinge to the cabinet boxes. That way I had a bit of “wiggle room” to move the door around on the hinge, and when I got it perfectly in place, I tightened the screws on the door. Boy, was it tricky. But that’s okay, because... ta-da! 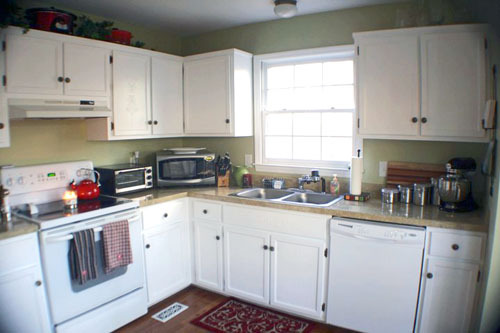 Beautiful white cabinets! I painted ours about six months ago, and the finish has held up quite well – no chips yet, at least. Painting laminate is a bit of a gamble, but we won’t have these shelves much longer, so I decided to risk it. Because you can’t sand laminate, it doesn’t take very well to paint and it just won’t hold up as well (so if you have laminate kitchen cabinets, don’t paint them, please!) Sure enough, I chipped the paint a few times when I put the shelves back together (nothing that couldn’t be touched up with a little leftover paint). They could have used a few more coats of primer before painting, but it was an on-the-cheap project using leftover primer only, and there was only enough for one coat. Still, surprisingly, the books and things haven’t scratched the shelves. I think that’s a pretty good endorsement for this method! 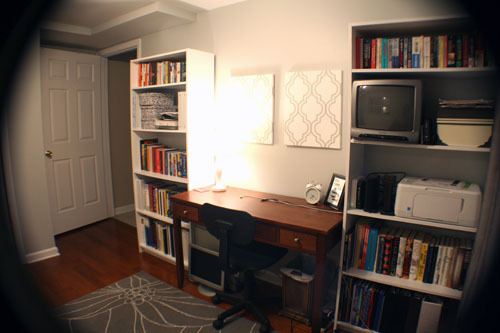 So you can adapt these general steps – oil-based primer, sand, then latex paint – to almost any furniture you want. 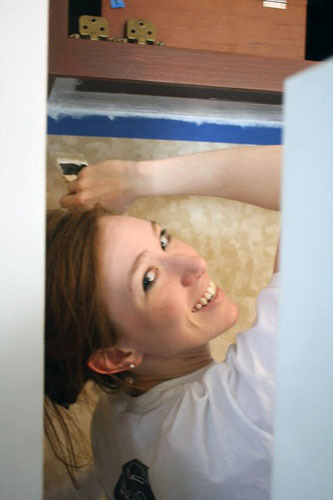 You could theoretically get it done in less than half the time if you don’t have a day job, but some things – like letting the paint dry – just can’t be rushed. It’s at least a long-weekend project. So, when can you come and paint my kitchen cabinets? And the walls, too, please? I've got the colors picked out!